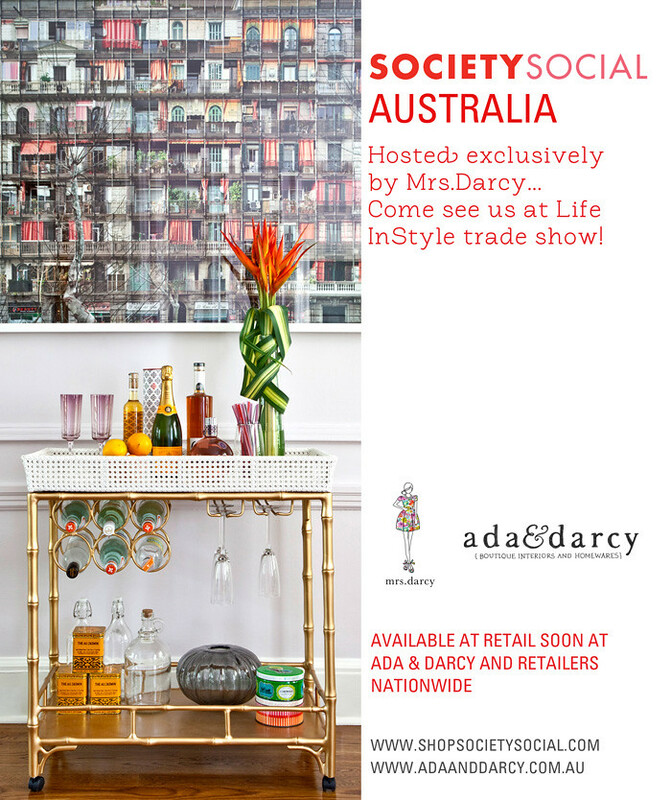 Ada and Darcy: Hello Society Social! With lots of changes that will be coming over the next few months, I'm very excited to have the opportunity to distribute the absolutely divine Society Social range throughout Australia + NZ. For those who love a bar cart, these are so delightful and fun, and of course, incredibly stylish. LOVE Society Social, especially those bar carts! Exciting that they've come to Australia! I might have just screamed with delight. Thank goodness I decided to check my Reader at home today rather than on the train. Exciting! I can't wait! I've been looking for a bar that is original just like yours. I'll be checking in! Oooohhh! I'm in love with that bar cart! Wishing you a wonderful weekend, Kellie! That bar cart is fabulous! What great news, Kellie! Have a lovely weekend. Such exciting news Kellie! I'm such a fan of Society Social. Gorgious barcart! Good luck at the show. lovin' the gold bamboo. so so chic. why yes, i'd love a champagne cocktail... please! Oooh, good luck, good luck! How exciting for you!! Have a wonderful time - and tell us all about it! So very exciting Kellie! Yay, Thank you for bringing Society Social here. Very exciting. The cart is pretty!! Thank you for your visit, you have a lovely blog. Wish I were in Australia!